Talking about kiting, most people visualize a kite in the waves at some beach. 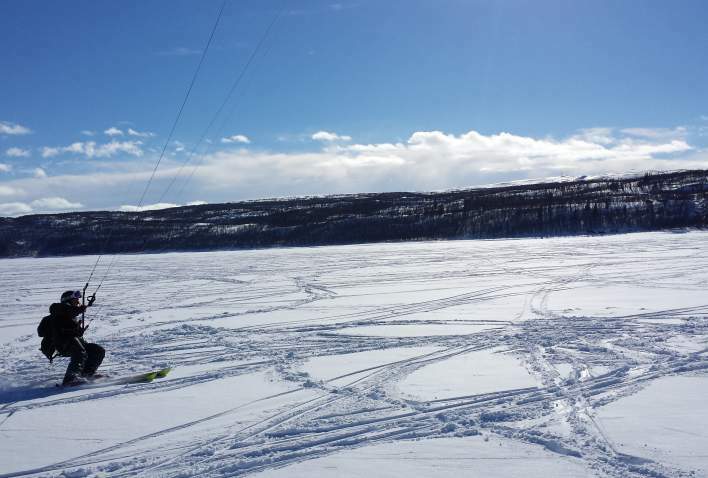 But kiting in snow is an adventure that is a must to try if you like a bit of adrenaline and action! Røros is one of the most popular places in Trøndelag to kite, which means to stand on a board on the water, or skiing on the snow, and using the power of a kite to gain momentum. You will really get to know the natural elements when the wind makes full tension in the pull, and you know that the speed increases and you turn the way you want, when you pull the rope. Storwartz outside Røros centre, has extremely good wind conditions. At Storwartz you will find large, flat areas, but also some hilly terrain that is more suitable for intermediates. Kiting at Storwartz works in all wind directions. Since such a large part of the area is flat, it is especially suitable for beginners. If you want to kite in powder snow, Meråker is a great option! Here you will find a hilly terrain with a great view. The best place to kite here is Kirkebyfjellet, and the season is from December to April. In Tydal you find Stugusjøen, which is a great lake with good snow conditions all winter. In the early winter the water is drained from the lake, which creates nice elevations close to land. 5. Fresh seafood from the Trøndelag coast. Directions: Drive at E14 in about 45 minutes from Stjørdal towards Meråker and Storlien. When you arrive at Meråker, follow the signs to Fagerlia Alpinsenter and drive up to the parking area. Take the top lift up. Parking: Parking area at Meråker alpinsenter. Good wind directions for kiting: west/north-west to east. Special considerations: When you arrive to the top, you should pull a little back onto the plateau before launching. Keep a good distance to the ski lift. Directions: Drive towards Røros, follow directions towards Brekken in the roundabout in Røros center. Follow the signs to Brekken Rv. 31. Drive towards Olavgruva, and follow the road for 3-4 minutes. Total time driving from Røros center is about 10 minutes. Directions: Drive towards Stjørdal towards Meråker and when arriving to Hell, take towards Selbu. Follow Fv. 705 to Stugudal in Tydal. About 2 hours drive. The lake is close to the road with good parking obtions.